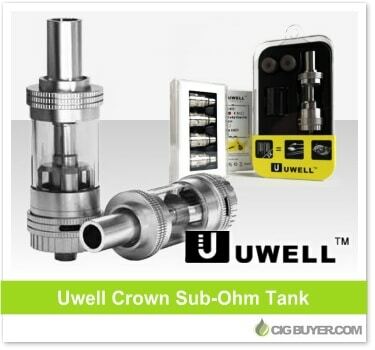 Capable of handing up to an astounding 120W of power, the Uwell Crown Sub-Ohm Tank is designed for the most rigorous sub ohm vaping and is compatible with single (1.2 ohm), dual (0.25 or 0.5 ohm) and temp control Ni200 coils (0.15 ohm) made from pure organic cotton; as well as a DIY RBA head (sold separately). Constructed of food grade stainless steel and quartz glass, the Crown Tank incorporates an easy to use top fill design with 4ml of capacity and features large adjustable airflow holes for producing monstrous clouds. 0.25 ohm dual coil reaches up to 120W!